The evolution of the bicycle and it’s symbiont, the cyclist, has fascinated scientists for generations. The fossil record suggests a link between the primitive pre-car culture, when humans would hasten their mobility with the help of large mammals in the family Equidae, and an early two-wheeled vehicle called the Hobby Horse (equus pastimicus). 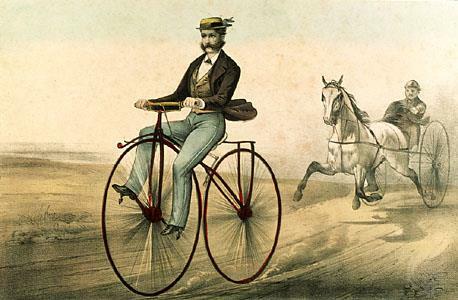 Subpopulations of these hobby horses later developed pedaling mechanisms and evolved into Velocipedes. After the appearance of this far superior propulsion system, selective pressure took over and there was a rapid evolution of different forms of the bicycle, from the Bone Shaker to the Penny Farthing and the Safety Bike. In time, both the bicycle and cyclist populations continued to evolve together into a number of specialized species like Downhill Mountain, Cruiser Tandem, Recumbent Touring Trike, and Trials. Epigenetic changes led to beautiful variations such as the Scraper Bike and the Burning Man. So for this bike party, help us celebrate Bikeodiversity! Ride with us on your most unusual steed, and make your outfit a proper cyclist display, be it in spandex, tweed, or however one might dress to ride. Sunset is just after 8pm so we’ll make our way over to West Cliff! Left on Almar to the ocean. East on West Cliff towards town. Break time out on the end of the wharf. Follow Beach St to the end, take the levee path along the river all the way to the shopping center by Petsmart.